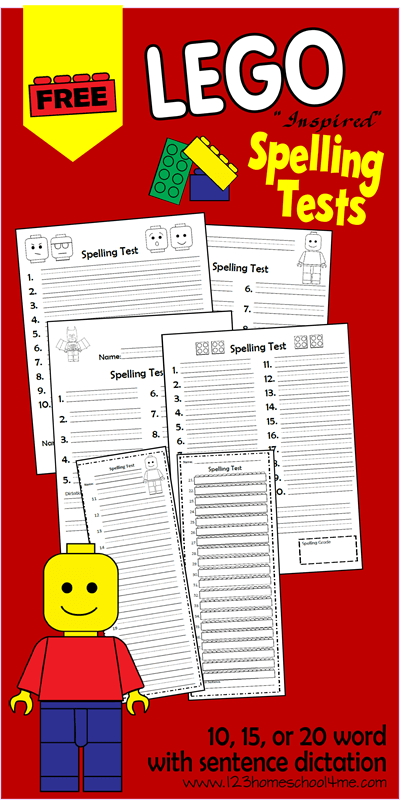 Free printable brick style spelling test for homeschoolers in 1st-6th grade. Each spelling test is for 10, 15, or 20 words with dictation. This is just one of our many FREE Worksheets for Kids! We like to make every subject as fun as possible. So I made it into a lego games with these Lego Inspired Spelling tests for Kindergarten- 6th graders to make spelling tests into a fun spelling games. These brick spelling tests work for 10, 15, or 20 words with or without sentence dictation. These Spelling Tests work with any spelling list no matter what spelling or language arts curriculum your homeschooling family uses. Note: All 14 Lego spelling tests use black & white clipart to help you save on ink costs! These can also be laminated and used with a dry erase marker to further save on printing costs! I subscribed to your site so I could access the LEGO spelling tests from this page. I still cannot access them. Please can you help me? I have tried everything I know how to do but it just keeps looping me and telling me to subscribe. Thanks!